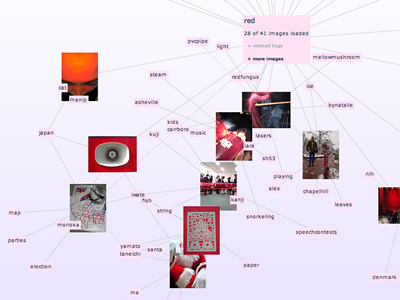 TagGraph is a force-directed graph that works as a folksonomy navigator by visualizing the relationships between Flickr tags. 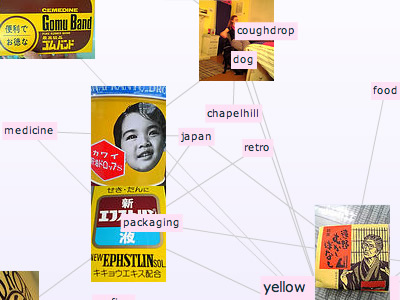 It resembles Flickr Graph, by Marcos Weskamp, in many ways. You can start by either entering a Flickr username or a tag, and the graph starts drawing itself automatically. You can load the images directly on the platform and do some basic tweaking such as zooming in and out, which can be quite useful when we get lost in the dozens of images populating the screen. Sounds promising Tobias. Let me know of the results of this experiment.